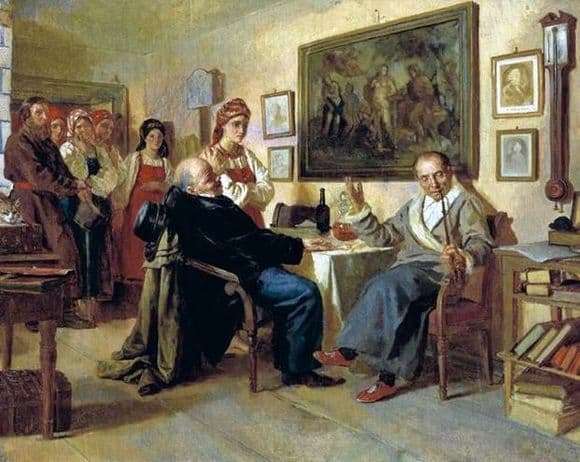 The painting “Bargaining. Scene from serf life “brought N. V. Nevrev enormous popularity. She was sold, and after a long time lying in the attic of her master. Just passed the fashion to decorate the walls of everyday scenes, fashion came to portraits. So the canvas was spoiled and even burst in place of the face of the peasant woman. After restoration, the painting became popular, and the fame of a realist and master of tragic everyday situations was fixed to the artist. The painting shows the process of selling serfs. Two arrogant wealthy barin trade in live goods. The very sight of these men speaks of the inhumanity of their nature. For them, this is a normal process, one fat young gentleman leaned back in his chair, and the other smokes a pipe. It seems that the transaction is passing, by the way, they do not betray the meaning of this event. Peasants crowded at the door, from them breathes anxiety and despair. Despair of people on whom nothing depends. During the serfdom the serfs belonged to the master. The artist very accurately reflected the whole horror of serfdom. The first owner of the picture also had serfs and, having acquired this picture, contemplated an everyday plot for himself every day. The artist gave the opportunity to look at all the consequences of serfdom. Perhaps because of this, the picture was so popular. It is very symbolic that a picture of the Renaissance hangs on the wall, where the main philosophical meaning is the value of a person, his life, offering people to the level of a deity. At the same time, a humiliating bargaining of human destiny takes place in the room. The artist with his work drew attention to the problem of serfdom. He expressed universal indignation of the social system. The picture shows how the society looks at that time. The images of rich gentlemen are very realistic. Perhaps the author sketched them with real people. Unfortunately, after this work a certain role was assigned to the artist, which he could not change until the end of his life.